I suggest you to please read my review before reading the synopsis. Thank You! Such beautiful and effortless writing, such a well crafted mystery, and yet what was with that ending! If I were to rate When the Lights Go Out on writing alone, I would give it all the stars. Mary Kubica aces the art of storytelling, but sadly completely misses with the conclusion of this one. As much as I enjoyed this whole story and the nearly flawless writing, I was majorly disappointed by the climax. When the Lights Go Out is an intense and emotionally riveting read that sucked me in since the very beginning. I was thoroughly invested in this story, savoring the gradually building suspense, trying to wrap up my mind around the countless unanswered questions and deeply moved by the grief and desperation of the two main characters, until, until, that twist happens, the one at the very end, the one that spoils it all. I nearly pulled my hair with frustration! Why? Why did the author do that? If only the last twenty five to thirty pages were different, this might have been a five star read for me. 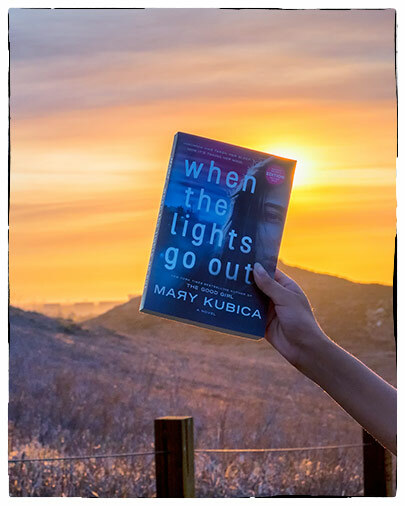 As it happens this was my first Mary Kubica experience, and since I’ve only heard/read good things about her in the literary community I was very excited for this one and up until two thirds of this book I was completely captivated. This isn’t one of those fast paced thrillers where something drastic happens every few chapters, it is more of a character driven, slow burn suspense that would pull its readers in, completely entangling the mystery with emotions. Like I mentioned at the very beginning the execution is excellent, if only the author had delivered with the ending as well. You might have noticed, I’ve said quite a lot without saying anything about the story line and that is exactly how I would recommend a reader to go in. If you happen to be one of those readers that enjoy slow and character driven psychological suspense, I would encourage you to read this without having any clue on what the story is about, because if you know beforehand what the book is centered around, you might have certain expectations from the story, and maybe, because of those expectations you won’t be entirely satisfied or even highly dissatisfied (like me) with how things get wrapped up. Going into the story blind might make it a more satisfying reading experience. Meanwhile, I’ll go dig up the author’s previous works. There’s no way my Mary Kubica experience stops with this one. Let me know if there are any you would recommend!